Interesting fact about the business: The dried shrimp business has been in Al’s family for four generations. Al Marmande, third-generation owner of Al’s Shrimp Company in Theriot, Louisiana, lays a special claim to shrimp fame as one of the oldest continuing shrimp drying operations in the United States. The Marmande family, which was one of the original French families in the south Louisiana area, can trace its roots all the way back to France. The company has carved a niche utilizing delicious Gulf shrimp to create some of the tastiest dried shrimp in the world. Al’s sons , Al, Jr. and Eric are the fourth generation. Eric is currently in college and helps around the business when he can. “Little Al” would work at the plant when he was in college, but he’s currently pursuing a different career. Dried shrimp are an intermediate moisture and shelf-stable product normally used as a food ingredient and flavor enhancer in the primary markets of Asia, Africa, South and Central America. In the United States, Louisiana, California and Hawaii use the highest volume of dried shrimp. The drying of shrimp was once the only way to effectively preserve shrimp for long distance transit. During the 19th century, Chinese business people taught the locals in Louisiana to dry shrimp on platforms, many of which were located on barrier islands or in shore side communities. The “Manila shrimp dance,” as Al calls it, was the task of rhythmically “dancing” or stepping on the shrimp to eject the meat from the shells and expel the heads. This dance originated from Filipino immigrants who comprised a large portion of the workforce in those early days. Al’s grandfather, Henri, Sr. started the business as Marmande Seafood in Theriot, along Bayou Dularge, in the early 1900’s where he dried shrimp the old-fashioned way. But Henri, Sr. was a businessman and was involved in more than dried shrimp. He sold another local product — sugar cane — and then opened a local general store, also in Theriot, where he sold dried shrimp and a variety of other local goods. Until about 1965, Henri would not only sell locally along the Gulf Coast, but he would travel to Europe and New York selling fur, sugar and dried shrimp to make money. In 1965, Hurricane Betsy destroyed his operations, and he was at a turning point. Henri, Sr. decided to re-build at a different location, at Falgout Canal, which is about 10 miles south of today’s location. This time, he decided to try his hand at drying shrimp in indoor conditions rather than outside. In fact, Al says that their operation was one of the first plants ever to do shrimp drying indoors. Henri, Sr. built the new operation with the help of an engineer named Louis Blum, a member of the Blum family who had been some of the pioneers of shrimp drying in the area. Louis Blum’s family had a dried shrimp distribution company called Blum and Bergeron, which is still one of Al’s primary customers today. Henri also distributed his dried shrimp through, Robert Hoy, a Chinese businessman, and his family, who were also early founders of the dried shrimp industry in Louisiana. They had started near Grand Isle in the early 1800’s and eventually moved their operation to Conti Street in New Orleans after a devastating hurricane claimed their facilities in Grand Isle. Hoy eventually evolved his business into more of a dried shrimp distribution company and became one of Marmande’s and Al’s biggest customers. Hoy eventually sold his company to Gulf Food Products in Harahan (a division of American Link in California), which remains one of Al’s largest customers. Henri, Sr. was really an office man at heart. He enjoyed the business side of the industry more than the drying side. He taught his son Henry, Jr. who took over operations, and eventually taught Henri, Jr.’s son Al how to get their hands dirty and help out at the plant. Al spent his high school years unloading boats and icing the shrimp down after school. Even after high school, he worked at the plant part-time in-between college classes. Al eventually bought the business from his father and changed the name to Al’s Shrimp Company in 1988 because his dad was still acquiring shrimp for drying under the Marmande Seafood name. Al. would buy shrimp from his dad and dry them at Al’s Shrimp. In 1991, yet another hurricane, Hurricane Andrew, wiped out the Falgout Canal plant location and Henri tried to talk Al out of rebuilding. But he was determined to rebuild the facility back even better than before, this time back in Theriot. 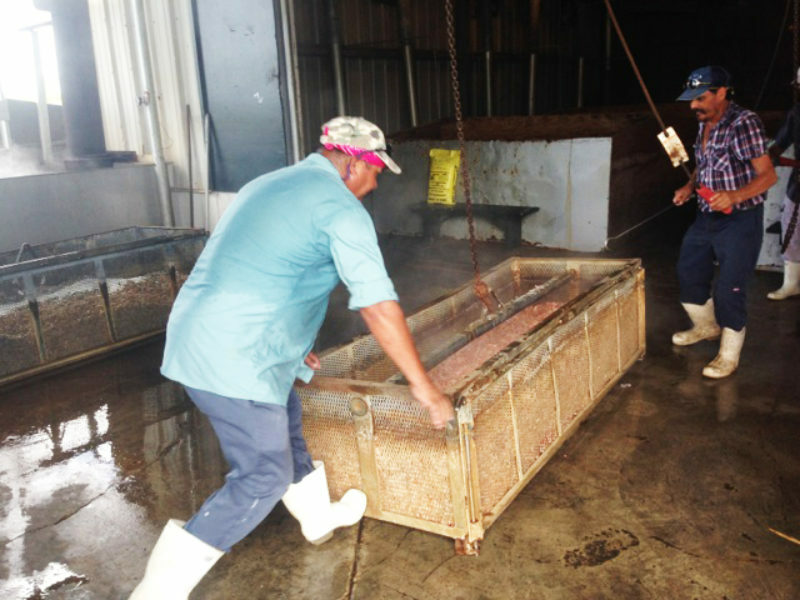 Today, Al’s Shrimp Company primarily dries shrimp with custom-made equipment in an 18,000 square foot facility. Most of the product is exported to wholesale customers in China and other Asian nations. Al compares the process to “making leather” because the drying process is very tedious and time-consuming – taking five to eight hours for dried shrimp to reach an internal “water activity level” required for product shelf-life stability and safety. Al says that it’s more of an art than a science to produce good dried shrimp. You have to start with good shrimp, and you have to know what you are looking for. First and foremost, he says, you have to use very, very fresh shrimp, or as he calls it “day shrimp,” meaning it has to have been caught that day. He only uses brown shrimp and white shrimp, and the primary time period for the best shrimp is April through December of each year. Al says that the shrimp are boiled immediately and then put through the drying process. Once dry, they are put into a tumbler, which is like a big barrel with holes in it. That process knocks off the tails and shells, leaving only the meat of the dried shrimp. “I have been drying shrimp down here since 1992, and our goal is to boil one million pounds of shrimp each year,” Al says. Al values long-lasting relationships with local fisherman and even names his products after them. ”Those guys would always bring me some of the best shrimp to boil. And Charlie Boy still does,” says Al. Al takes pride in the fact that he has had loyal customers for so many years. He is especially proud of offering them a consistent, chemical-free, dried shrimp product. He links his success to a great deal of trial and error and still does everything the old fashioned way, including his bookkeeping, just like his grandfather did when he owned the company. Copyright © 2019 American Shrimp Processors Association.